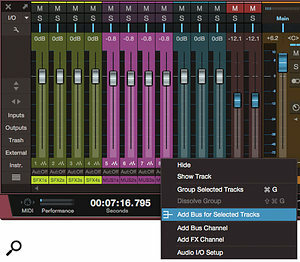 Extensive side–chain options make Studio One’s mixer the perfect place to experiment with ducking. One attribute of a good mix is that the lead element at any given time, whether vocal, instrumental, or an effect, is unobscured by the rest of the elements. There are many great techniques for making room for the lead, including fitting different elements into their own compartments in the frequency spectrum, and spatial placement. This month, I am going to talk about how to realise in Studio One a well–known but oddly under–used technique: ducking. Ducking, for those to whom it is not yet well–known, is a technique that uses the lead element to trigger a compressor to reduce gain for other mix elements. Screen 1 shows how this is accomplished by routing the lead element to the side–chain of a compressor through which the other elements are passing. When the lead element exceeds the compressor threshold, the gain of the mix elements routed through the compressor is reduced, ‘ducking’ them out of the way of the lead elements. When the lead element’s level falls below the threshold, the gain of the compressor returns to normal and the background elements come back up. Screen 1: Ducking flow chart. Compression is triggered by an external signal. The classic application for ducking has long been ensuring that the voice of an announcer, for instance in an advert or a radio DJ talking over a song intro, can be heard clearly over background music. Ducking is particularly helpful with the spoken word because, while singing is intended to blend with other instruments in a musical setting, speech is usually intended to be clearly differentiated from other mix elements to achieve the greatest intelligibility. Nevertheless, ducking is a technique with broader uses that can be far more subtle. In fact, I nearly always try to make it sound as unnoticeable as possible. 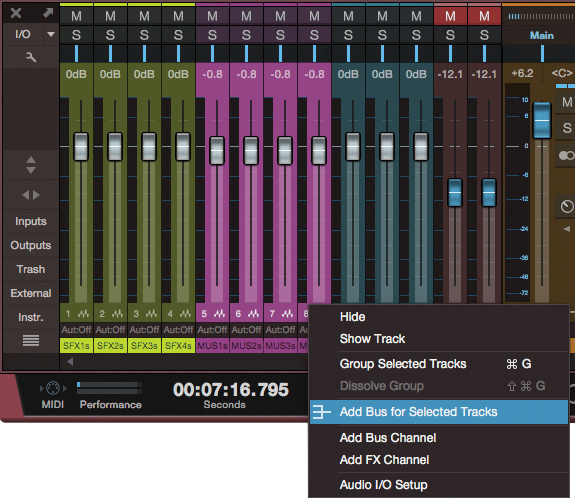 It’s very easy to access and assign side–chain signals in Studio One, which makes it a great environment for ducking applications. Let’s look at a few. Screen 2: The part of the session for my teletale that shows the dialogue, music and effects submix masters. The PreSonus Compressor plug–in visible in the inserts sections of the music and effects submix masters provides ducking triggered by the dialogue. The UAD 1176 compressors are essentially limiting peaks.My latest application of ducking in Studio One is pretty close to the classic model. I have worked on a couple of talking books and, recently, what I like to call a ‘teletale’: a story told by a speaker, supported by rich music and sound design. One key to making ducking work is setting things up so it’s easy to control the elements you want to duck. While I can envision scenarios where I might implement ducking on a channel–by–channel basis, I tend to use a lot of submixing in my projects, and nearly always find it easier and better to route elements through submixes and then duck the submix masters. One of the reasons I like mixing in Studio One is the speed with which I can set up all of these submixes. Of course, you have to start by figuring out what submixes you need. The more ‘high level’ you can make your submixes, the fewer there are and the less work it is to put ducking in place and get it sounding good. Simplest of all would be to have a stereo submix of everything except the lead element that’s doing the ducking. For my teletale, I have created submixes for dialogue, music and sound effects, as in any standard audio post environment. Screen 2 shows how the session is set up. I can imagine situations that would require a lower–level breakout of submixes to achieve a desired ducking goal, but it usually ends up only being necessary to duck one or two submixes. Set up the submixes by selecting the channels you want in a submix, right–clicking on any of the selected channels, and choosing Add Bus for Selected Tracks. If you have enough tracks that you need to submix them, you are likely to find it useful to organise the Arrange window as well as the mixer; in my session, I have created track folders for dialogue, music and effects. 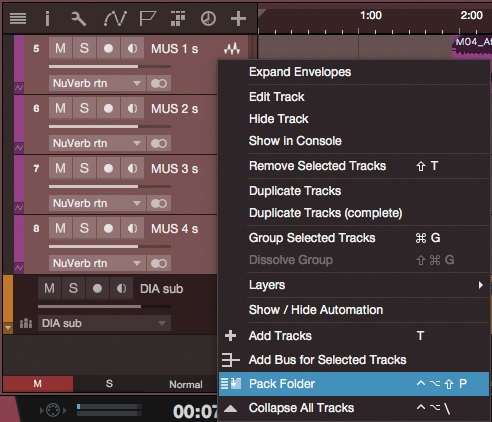 Studio One’s folders work exceptionally well in this application because each folder can be assigned to the appropriate submix master, and all of the tracks in the folder will be routed to that. For each submix you need, simply set up the submix, pack a folder, assign the folder to the submix, and you’re in great shape. 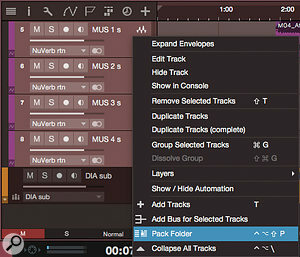 Screen 3: Making a submix (left) and packing a folder. This way of organising things facilitates ducking. With submixes in place, there are only two steps to setting up ducking. 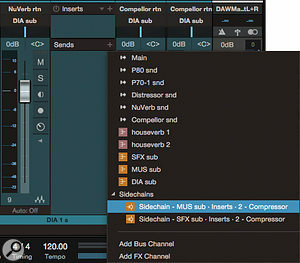 Step one is to add a compressor to the channel you want to duck — for instance, the music submix master. Although many compressor plug–ins have side–chains, not all do, so before you go to a lot of trouble dialling in the perfect settings, be sure you’re using a ‘duckable’ plug–in. Settings vary with the circumstances, but a good starting point is a low ratio (say, 2:1), medium fast attack (maybe 15 or 20 ms), and a really slow release time, sometimes as much as 600 or 700 ms. The idea is to set the attack fast enough to get the ducked signal out of the way quickly, but slow enough to not sound too heavy–handed. The release is set very long to avoid hearing the gain come back up during short pauses between phrases. It’s best to set the threshold by ear once everything is set up and working. The second step is adding a new send to the source, in this case the dialogue submix master. When the drop–down list of buses appears, move the cursor to the Sidechains legend at the bottom of the list and select the compressor on the music submix master as the target. That ought to do it, but it is best to go back to the compressor and check that it is somehow indicating the presence of external side–chain control. I frequently need only to adjust the compressor threshold to taste and I’m good to go, but it might also be necessary to fool with the attack and release times, or the ratio, depending on the characteristics of the speech and the compressor. It’s not a huge jump to realise that this same technique can be applied in purely musical contexts. Again, you could route everything but the vocals into a submix with a compressor on the submix master that does the ducking. However, I often find I don’t want the bass or drums to be ducked by the vocals, so I’ll create a separate submix for those tracks, and apply ducking to a further submix of guitars, keyboards, horns and other sources competing in the vocal range. Since this system uses send buses for the side–chain signals, it is easy to combine several signals on the side–chain bus, but I have not yet had any reason to do so. Screen 4: Selecting a side–chain as the destination for a send. My most frequent use of ducking in music production, though, is on long reverb or delay tails. A long, spacey delay can sound awesome on a vocal, but it also can swallow the vocal up. Using the vocal signal to duck the effects can make a significant difference, even with only a couple of dB of ducking. This application differs from the others I’ve described so far in that subtlety clearly is not the goal when using a recirculating 700ms delay line or a six–second reverb tail. When I duck effects tails, I tend towards more aggressive ducking, with faster attack and release times, and often more gain reduction. There are other compression tricks that can be applied to ducking, especially frequency–sensitive compression. You might want to make the ducking compressor less sensitive to low frequencies, or perhaps make a compressor on drum overheads more sensitive to sibilance frequencies to reduce competition between vocals and cymbals. Some compressor plug–ins have onboard filtering for the side–chain signal, which makes life simple. However, while the compressor plug–in PreSonus bundle with Studio One has onboard filtering, the filtering is disabled when using an external side–chain signal. The solution for this is to create another bus channel, add the desired EQ on it, and interpose it between the source ‘ducker’ channel and the target ‘duckee’ channel. A bit of extra work, but worthwhile. Ducking requires a bit of work to set up, but Studio One’s side–chain, submixing, and folder features keep the effort at a reasonable level, and when properly set up, it can be startling the difference 1–2 dB of ducking can make in the clarity of the mix’s lead element. Most of the goals for which you’d use ducking can also be achieved with automation, and deciding which is the better approach for any given situation is always a judgement call. Automation is more precise and detailed, but it also takes more time to put in place. A lot can depend on the pacing of the vocal or triggering signal. Where the vocal track has a lot of pauses, it might be hard to set ducking up without audible pumping occurring, so automation could be a better choice there, even if it takes longer. By contrast, if the vocalist rattles off a long paragraph or verse and then stops for several seconds, ducking should be much easier to apply. The same considerations apply to when you’re trying to get delay or reverb effects out of the way of the vocal; ducking works better on a solo with long, fluid lines than on one that is choppy, with short pauses between phrases. Of course, this all assumes you don’t want the sound of pumping, but pumping can sound cool in some settings. In those cases, try more aggressive settings. Make the sucker work some and see what comes out.